Contactless and Chip technology makes your Commerce Bank Card safer. 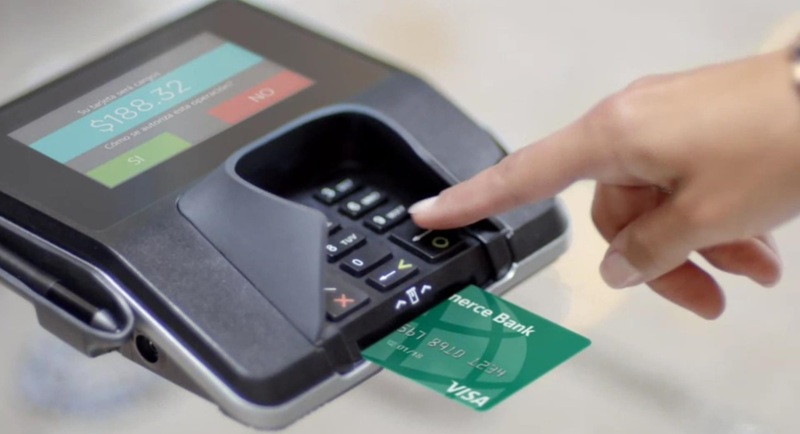 Every time you tap your card at a contactless-enabled terminal, or insert your chip card into a chip terminal, the payment technology protects your information by creating a unique transaction code. This transaction code cannot be replicated, keeping you better protected against counterfeit fraud. It’s easy to pay at a chip terminal. Simply insert your chip card and follow the prompts. If a retailer is not yet chip-enabled, you can still swipe your card to pay. You can now tap to pay with your Contactless Card for fast, easy, secure2 checkout. Here's all you need to know to confidently use your new card. Your contactless Commerce Bank Chip Card comes with proven technology that is already in use around the world. So whether you’re close to home or thousands of miles away, you can pay with confidence. View Chip Cards frequently asked questions. View contactless cards frequently asked questions. Contactless Visa cards use the same dynamic security as chip cards. Each transaction is accompanied by a one-time code that protects your payment information.